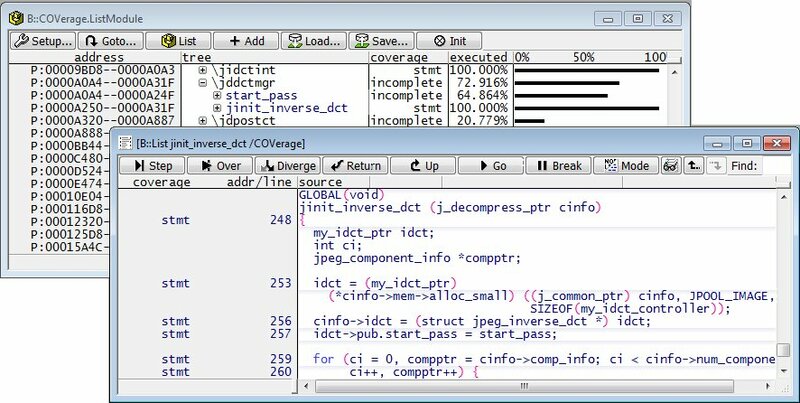 TRACE32 supports a variety of code coverage metrics. For most metrics, the source files and the trace recording is sufficient. However, some metrics require additionally a source code analysis. Code coverage results are provided on module, function and source code level. Lauterbach offers the t32cast command line tool to perform the source code analysis and to generate the meta data. t32cast is compiler independent and can easily integrated into the build process. TRACE32 must know the structure of the decisions and their position in the source code in order to perform MC/DC. The t32cast command tool has to be used to generate this information, which is not part of the debug information generated by the compiler. At the same time, it must be ensured that trace information is generated for all conditions. This is the case when each condition at the source code level is represented by a conditional jump at the object code level. This can be achieved by the appropriate compiler settings.